Heading into Day 2 of the arena day of the DreamLeague Major 2019, we’re going to take a close look at a game between two teams who most would not have expected to find themselves in this position but for rather different reasons. 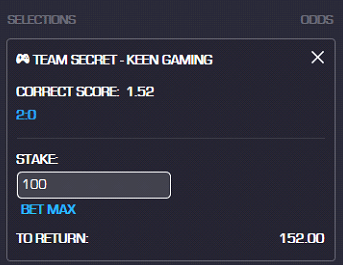 For starters, no one would have expected Team Secret to be in the lower brackets at a Major. After winning multiple tournaments this season, including the Chongqing Major, most expected Team Secret to comfortably be in the upper brackets contending for the title. On the other hand, Keen Gaming was all but expected to have been eliminated by now, but for some reason, they’ve hung on, beating Evil Geniuses before falling to Fnatic to find themselves squaring up against Team Secret once again. These two Dota 2 teams have already met earlier in the tournament during the group stages and nothing there indicated that this could be a close series. Throughout their tournament run so far, one thing that Keen Gaming have made clear is how they rely so much on the brilliance of Kaka. Regardless of whether they win or lose, the TI7 runner-up was arguably the team’s best performer, playing the role of playmaker for his team as he secured lanes and created space all throughout the map for his team. Unfortunately, Team Secret has that themselves in the form of YapZOr. Not to mention, Team Secret have multiple players who could be considered as win conditions in on themselves, led by none other than their core duo of Nisha and Midone. Keen Gaming haven’t really shown that they have anyone outside of Kaka in their roster that can simply take over games. Old Chicken is a stable veteran and a strong hard carry player, but he doesn’t exactly force teams to adjust. The same goes for Old Eleven or their relatively unknown mid laner. We saw in their series against Fnatic how Keen Gaming desperately needs someone to step up to help Kaka and become the focal point for the team and it’s highly unlikely that they’ll find that player anytime soon. Team Secret are arguably the deepest Dota 2 team right now. They might be in the lower brackets, but for them to get here, Vici Gaming had to make sure that MidOne had two bad games in a row against them. Whether it was a stroke of genius in their part, or just MidOne slumping in the tournament, or a combination of both, we’ll never know, but unlike Vici Gaming who had switchable and dominant cores in Paparazi and Ori, Keen Gaming doesn’t really have that dominant mid laner who can make MidOne suffer through a horrible laning phase and severely limit his impact on the game. With that said, this series should be over rather quickly with Team Secret better off preparing for which of Virtus.Pro and PSG.LGD they’ll be facing off against at the end of the day.